Welcome to Boy Scout Troop 365! Greetings! Troop 365 is a boy-run troop based in Glendale, Arizona. Our troop is chartered and meets weekly at the Dream City Church Glendale Campus on Monday evenings. To learn more about scouting in general, visit BeAScout.org. Interested in visiting or joining? Please see About Us/How to Join on the menu bar on the left side of the page. For general inquiries, service requests, and more information about our troop, please contact us. Please note that our Boy Scout troop is for boys ages 11-18. Boys under the age of 11 may want to check out Cub Scouts. Cub Scout Pack 365 also meets at Dream City Church. For more information, visit http://troopwebhostcs.org/pack365glendale/. Note: Access to main areas of the troop web site is restricted to troop members. If you are a member of Troop 365, please use your login to view the entire web site, including the calendar, roster, forms, and other useful information. If you are a current troop member (leaders, scouts, and parents), and you do not know how to log in to the web site, please contact us via this form for access or see Terri King during any troop meeting. Surpise! Camp Raymond 2019 Changed to Camp Geronimo 2019!! One of the biggest events in our Troop Year every year is Summer Camp. This year we will be going to Camp Raymond, leaving on Sunday June 23 and returning Saturday June 29. We know from experience that this is a huge part fo the Scouting experience, and we often hear from young Scouts that this week is their favorite Scouting event of all! We camp as patrols and as a Troop, and do a mix of hikes, merit badges, and much more. Payment schedule: $90 payments due by March 3, March 31, and April 28 meetings, with balance at June 3 meeting. See Chris Oless to make payments . Let him know that you plan to go to camp. You can sign up right here on the website! Unit Accounts: and Flag Service: You can use funds in unit accounts to make payments at any time. Funds earned for flag service in the 2018-2019 season through the Memorial Day 2016 flag service and will be calculated after that event and available to apply as part of the last payment. Camperships: Both the Grand Canyon Council and Troop 365 offer camperships to help with fees for those in need . A form can be found on our website. It needs to be in Ms. Buchanan’s hands ASAP, as the Council started awarding camperships early in April! he application is attached to this message. Also see: a separate announcement about slecting your merit badges. Summer Camp at Camp Raymond: Select the merit badges that you want by April 15! Scouts that are on the early part of the Trail to Eagle -- especially working on Scout, Tenderfoot, or Second Class -- may want to consider signing up for the Brownsea Island Adventure (BSI). Also known as Trail to First Class, BSI scouts can complete many requirements for Scout, Tenderfoot, Second Class, and First Class ranks. That will fill up the morning, and you'll also get a chance to earn the Scouting Heritage Merit Badge and get recognized at the closing campfire. You can then sign up for one or two badges in the 2-4 PM range and just mark "BSI" for the morning time slots. It's a great way to kickstart your Trail to Eagle! Note that some badges meet for two hours at a time.Cooking, Climbing, Shotgun, and Rifle are examples.Note that the Fishing / Fish and Wlldlife / Fly Fishing combo takes up 2 periods but leads to 3 merit badges! Note that some badges -- such as Emergency Preparedness and LifeSaving -- require you to already have another badge first -- First Aid for Emergency Prep and Swimming for Lifesaving. Some are for older boys - generally 14 and up -- specifically shotgun shooting, fly fishing, and metal working -- for safety reasons. A number of them will have prerequisites - part of the requirements that you need to do before getting to camp if you wnat to finish. The list of prerequisites is also attached here. Questions? Just drop a line to Mr. Hetrick at rjhetrick@gmail.com! Congratulations to our New Eagle Scout! Peter Ambelang passed his Eagle Board of Review on March 21, 2019. I know his parents and all the leaders of the troop are very proud of Peter. He is the 116th Eagle in our troop and the first for us in 2019. Congratulations to Peter on this wonderful achievement! His family invites you to attend his Eagle Court of Honor scheduled for May 18th at 10:30 AM at the Bridge (same place as our meetings). REGISTER ONLINE HERE. Are you a registered Boy Scout, Varsity Scout, Venture Scout, Sea Scout or Adult Leader? Will you be 13 years of age prior to May 31, 2020? Are you in good health evidenced by your BSA Annual Health and Medical Record? Have you always wanted to go to SEA BASE? If you answered YES to all of these questions, PLEASE REPLY to gmyrekfamily@gmail.com and let us know that you are INTERESTED in going on a Sea Base Adventure next summer. You can also reply with questions. This is NOT a commitment, yet. We are only looking to see if there is interest. Your interest will help us know how many spots to reserve. Trip reservations are limited and are filling fast so please reply by SUNDAY MARCH 31, 2019. On the weekend May 3-5, the troop will be doing a duel route Backpack, The shorter hike will start at the General Springs Cabin and the Fred Haught Trail. 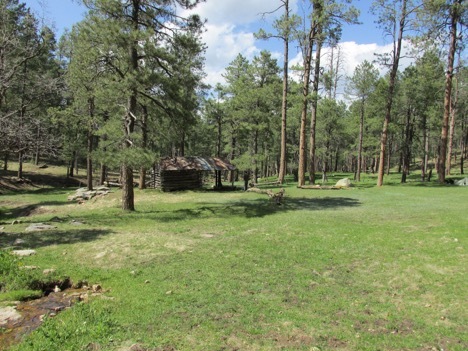 Camp will be near the ruins of the Fred Haught Cabin (approximately 3.5 mile hike). The longer hike will also start at the General Springs Cabin and hike about 17 miles ending on Highway #87. We will be overnighting near Blue Ridge Reservoir. (The long hike also has the option of doing a trek within the Cabin Loop area.) The weather should be cool up in the rim country and with the spring rains, everything should be green. Summer Camp at Camp Geronimo!